Fortunately, all of these conditions can be simulated simultaneously in terrestrial labs. 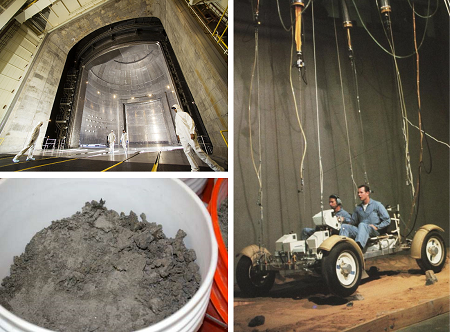 NASA's Space Power Facility is a very large vacuum chamber that can be brought down to liquid nitrogen temperatures. Abrasive regolith simulant can be used. The 3-second control time delay can be programmed into the electronics. For the 1/6th gravity, we can do what was done during the Apollo program. Tethers can be used to suspend 5/6th of the weight. Alternately, zero-gee flights could be conducted providing very realistic 1/6th gravity for 30 seconds at a time. Leading telerobotics companies (e.g. telerobotics mining companies) could iteratively develop the telerobots until they operated in a robust manner. Two points worth considering is that aluminum is a metal which does not become brittle at very low temperatures. For example, the large external fuel tank for the Space Shuttle carried liquid hydrogen and underwent severe aerodynamic forces during launch. So, any part of the telerobots or landers touching the ground should be made out of aluminum. Secondly, some of the power coming down from the solar drapes could be used to provide body heat so as to keep the bodies of the lander and telerobots at whatever temperature one wishes.